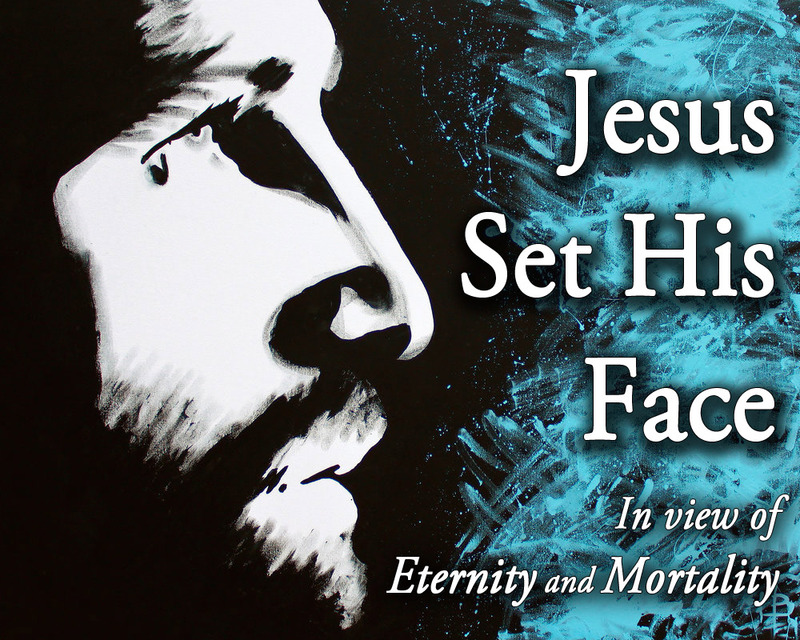 During the season of Lent, and beginning the week of March 10, our small groups launched a 5-week study series we’re calling Jesus Set His Face: In View of Eternity and Mortality. It’s not too late to jump in! At the center of who Jesus is, and at the very heart of the person and work of Jesus, we have the miracle of the incarnation. God and man come together, fully, completely, miraculously. Divine-human. Spirit-truth. Transcendent-immanent. Teacher-healer. One who lived his life, at once, in view of eternity and in view of mortality. Each week of Lent, we’re exploring the biblical and theological implications of eternity and mortality, and we’ll do so by using many voices from both the lectionary readings and Sunday teachings. These tools will help us describe then define who we are and what we do in the right now: For who we are and what we do is critically important when it comes to God’s purposes for the world and the Kingdom now. But there’s more: Who we are and what we do now also has critically important implications beyond our lifetime. One more important note: The series includes the lectionary readings for Lent, so we’ll also have an opportunity for discuss further the things Pastor Chris teaches in the Sunday worship service. If you’d like you can get a head start on meditating on these topics just click here for a handy website that lists all the lectionary passages. Two Sunday Options at 6 PM: The Chapel (our Carmichael worship location); Deanne & Rick Asche’s house with a delicious dinner (Lincoln) (Email for info). Wednesdays at 7 PM: Covell’s home (Orangevale) (Email for info). About the Logo for this Study: The design we’re using for the logo for this series is by artist Lance Brown, the “speed painter.” Colorblind Christian Lance Brown (right) portrays a powerful message through every Christian speed painting he does during his live performance art. Each stunning piece of artwork takes less than 6 minutes to complete. Some are even painted upside down, revealing the true masterpiece when turned over at the end. Learn more about this remarkable artist and his ministry by clicking here. Circle the last Saturday of the month on your calendars for Movie Night at the Chapter House! 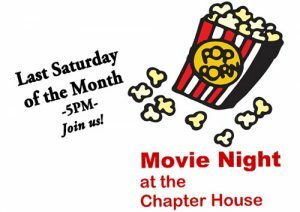 Each month we’ll feature a great movie and have some wonderful discussion– and bring a treat or drinks, too, if you like. Jay Dudley will host the evening. We’ll get started at 5 PM and the event lasts about 2 hours. 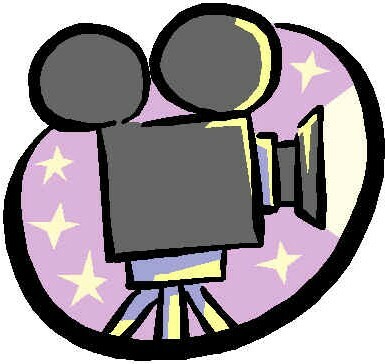 For details, including each month’s featured film, please contact Jay. Already seen the movie? Even better! You’ll have lots to add to the discussion. Want to see the movie title (or learn more about it) for a particular Saturday? Check out the Epiclesis calendar and click on the event. 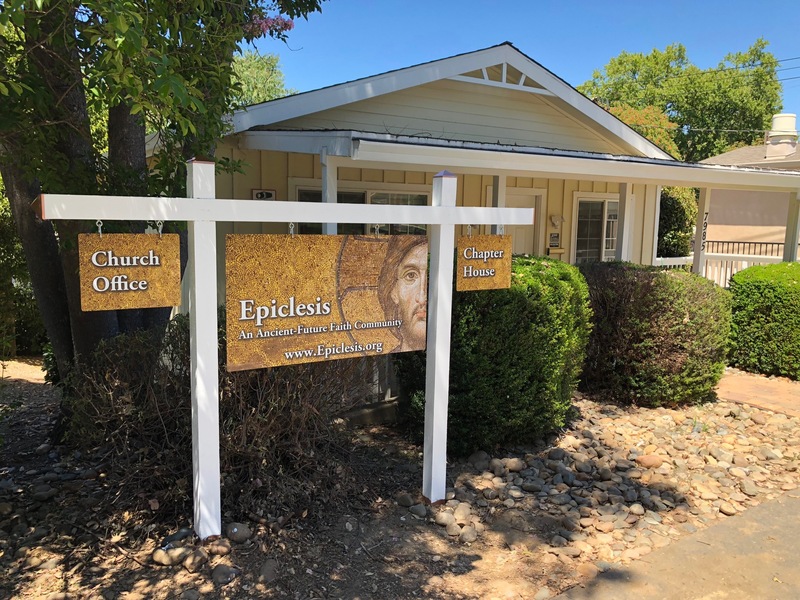 After a couple of years of actively looking and much prayer, we joyfully announce the opening of the Epiclesis “Chapter House” (right) in Old Fair Oaks Village. We’ll continue to worship and have major gatherings at our present Carmichael location at the Chapel on Winding Way, with no plans to move, but will use the Chapter House for office needs and small meetings, Bible study, prayer, and as a launching pad for ministry. Our congregation and elders have longed for place we could call our own during the week. Now, with God’s direction and provision, we have found a wonderful space. Why is it called a “Chapter House”? A chapter house is a building or room attached to a cathedral where meetings are held. In monastic communities, the monks gather there to read aloud from the Bible, discuss theology, or share the news of the day. We love the idea of recovering and reinterpreting this practice in an Ancient-Future way. So, our Chapter House will be a place for us as a community of faith, a place for you individually, and a place for all of us to do ministry together. The address is: 7985 Park Drive; Fair Oaks; 95628, right across the street from the Plaza Park, Village Park, and Fair Oaks Theater Festival– and just a short stroll to all the Fair Oaks Village shops and restaurants (left). Would you like to see more pictures of the interior spaces of the Chapter House? We’re working on the finishing touches (as of 8/22) and we’ll have a full set of pics ready for you shortly. About Old Fair Oaks: The Village is a regional destination with a cozy, small-town appeal. 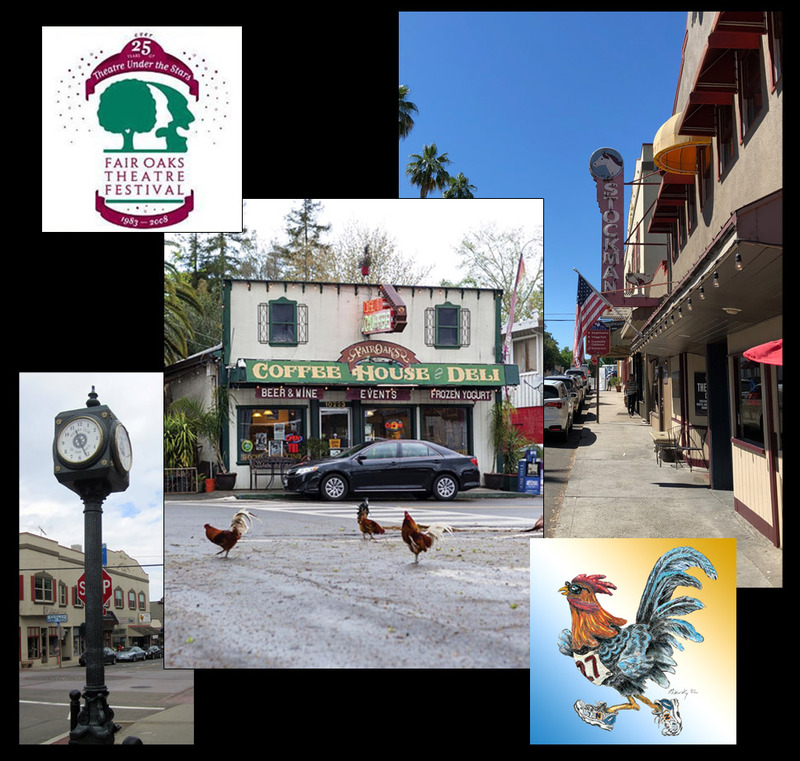 About a half-mile from the American River Parkway, it’s home to parks, a playground, quaint shops, coffee spots, and eateries– not to mention lots of chickens. The Fair Oaks Theatre Festival has been offering professional plays, concerts, and comedy nights to the community for nearly 40 years. The Village is bike- and pedestrian-friendly and draws lots of visitors, especially to summer concerts on Thursdays in the park. Christmas in the Village, complete with carolers, tree lighting and a parade, is also a local favorite. Bless you… and come see us at the Chapter House! We’re used to references to the Holy Trinity in the various creeds we recite, but may be less confident about how the Trinity relates to worship. This wonderful, readable book beautifully explains how the Godhead is intimately involved in, and animates, true Trinitarian, Christian worship. Chris Cook. Southern artist Chris Cook works in a variety of media. Likely influenced by his work as a commercial illustrator, exposure through books on other artist and his experimentation as an artist, his work began to take on many different looks and he also moved into dimensional art – sculpture. His spiritual paintings cover a variety of Old and New Testament themes. The thumbnail on the right shows his interpretation of the epiphany on the Mountain of Transfiguration. 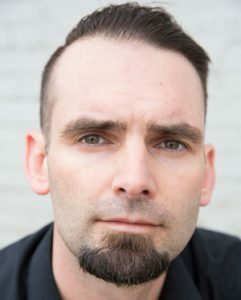 Daniel Bonnell. Take some time to wander through the beautiful website of artist Daniel Bonnell to see a remarkable collection of striking works in mixed media on a variety of biblical topics. You can find out more about the artist here, and please also consider joining Bonnell’s free patron community by clicking here. Bonnell’s art may be found in private collections and churches around the world. A graduate of the Atlanta College of Art, he continued his studies under the direction of renown photographer Ansel Adams and, later, the French Dominican Monk Pere Couturier, who was responsible for encouraging Henri Matisse to create sacred art. Mark Lawrence. Even a quick trip to artist Mark Lawrence’s website will reveal a visually stunning style you’ve likely never seen before. Lawrence innovated what he calls the “Painting With Light” technique in 2006 with a desire to express God’s word more deeply through his spiritual art. The special digital process re-renders his art using the selected Bible verse that inspired the original painting as a paintbrush. Lawrence writes, Creating and sharing art is something that I just have to do or I’ll explode. I am so blessed that God has allowed me to be used in this way. I am driven by a mission and a vision to share God’s Word with the billions of searching people who need Jesus in their lives. Richard McBee. Born in 1947, McBee studied painting at the Art Students League of New York and has dealt exclusively with subject matter from the Torah and Jewish history in figurative narratives since 1976. The subject matter of his paintings includes classic Old Testament stories. Additionally he has made many figurative relief sculptures, unique ceramic menorahs and other Judaica. In 1991 he was one of the founding members of the American Guild of Judaic Art. Find his website here. Iain McKillop. Working mostly in the field of Christian religious works of mixed media, English artist Iain McKillop is another favorite of our community of faith. Find out more about this artist and his striking style at his website here. The artist lives in England and his creative works may be found in a wide variety of locations including private homes, historic sites, public locations, and churches and cathedrals. Perhaps some of McKillop’s most striking works are those associated with the events leading up to, including, and after the Passion of Christ. Philip Ratner. Internationally-renowned multimedia artist and native Washingtonian, Phillip Ratner is the grandson of Ellis Island immigrants. Also known as “The Artist of Ellis Island,” numerous Ratner bronzes can be found at the base of the Statue of Liberty on Liberty Island and in the National History Museum at Ellis Island. Ratner works in sculpture, painting, glass, tapestry, drawing, lithography and the graphic arts. In 1984, he opened The Israel Bible Museum in Safad, Israel. Ratner also spent time in Israel using sculpture, painting and graphics to design more than 250 works of art relating to the Hebrew Bible. Ratner has degrees from Pratt Institute and American University, and for 23 years taught in Washington, D.C. area public schools. He continually builds his reputation as an international artist.